↑ ୧.୦ ୧.୧ Naish, Jeannette; Court, Denise Syndercombe (2014). Medical sciences (2 ed.). p. 562. ISBN 9780702052491. ↑ ୨.୦ ୨.୧ ୨.୨ "High Blood Pressure Fact Sheet". CDC. February 19, 2015. Retrieved 6 March 2016. ↑ ୫.୦ ୫.୧ ୫.୨ ୫.୩ ୫.୪ ୫.୫ ୫.୬ ୫.୭ ୫.୮ Poulter, NR; Prabhakaran, D; Caulfield, M (22 August 2015). "Hypertension". Lancet (London, England). 386 (9995): 801–12. doi:10.1016/s0140-6736(14)61468-9. PMID 25832858. ↑ Carretero OA, Oparil S; Oparil (January 2000). "Essential hypertension. Part I: definition and etiology". Circulation. 101 (3): 329–35. doi:10.1161/01.CIR.101.3.329. PMID 10645931. ↑ Giuseppe, Mancia; Fagard, R; Narkiewicz, K; Redon, J; Zanchetti, A; Bohm, M; Christiaens, T; Cifkova, R; De Backer, G; Dominiczak, A; Galderisi, M; Grobbee, DE; Jaarsma, T; Kirchhof, P; Kjeldsen, SE; Laurent, S; Manolis, AJ; Nilsson, PM; Ruilope, LM; Schmieder, RE; Sirnes, PA; Sleight, P; Viigimaa, M; Waeber, B; Zannad, F; Redon, J; Dominiczak, A; Narkiewicz, K; Nilsson, PM; et al. (July 2013). "2013 ESH/ESC Guidelines for the management of arterial hypertension: The Task Force for the management of arterial hypertension of the European Society of Hypertension (ESH) and of the European Society of Cardiology (ESC)". European Heart Journal. 34 (28): 2159–219. doi:10.1093/eurheartj/eht151. PMID 23771844. ↑ ୯.୦ ୯.୧ "How Is High Blood Pressure Treated?". National Heart, Lung, and Blood Institute. September 10, 2015. Retrieved 6 March 2016. ↑ Sundström, Johan; Arima, Hisatomi; Jackson, Rod; Turnbull, Fiona; Rahimi, Kazem; Chalmers, John; Woodward, Mark; Neal, Bruce (February 2015). 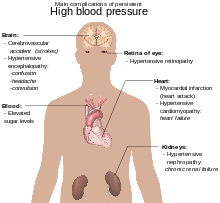 "Effects of Blood Pressure Reduction in Mild Hypertension". Annals of Internal Medicine. 162: 184–91. doi:10.7326/M14-0773. PMID 25531552. ↑ Xie, X; Atkins, E; Lv, J; Bennett, A; Neal, B; Ninomiya, T; Woodward, M; MacMahon, S; Turnbull, F; Hillis, GS; Chalmers, J; Mant, J; Salam, A; Rahimi, K; Perkovic, V; Rodgers, A (30 January 2016). "Effects of intensive blood pressure lowering on cardiovascular and renal outcomes: updated systematic review and meta-analysis". Lancet (London, England). 387 (10017): 435–443. doi:10.1016/S0140-6736(15)00805-3. PMID 26559744. ↑ Diao, D; Wright, JM; Cundiff, DK; Gueyffier, F (Aug 15, 2012). "Pharmacotherapy for mild hypertension". The Cochrane database of systematic reviews. 8: CD006742. doi:10.1002/14651858.CD006742.pub2. PMID 22895954. ↑ Campbell, NR; Lackland, DT; Lisheng, L; Niebylski, ML; Nilsson, PM; Zhang, XH (March 2015). "Using the Global Burden of Disease study to assist development of nation-specific fact sheets to promote prevention and control of hypertension and reduction in dietary salt: a resource from the World Hypertension League". Journal of clinical hypertension (Greenwich, Conn.). 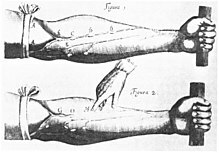 17 (3): 165–7. doi:10.1111/jch.12479. PMID 25644474. ↑ Gibson, Paul (July 30, 2009). "Hypertension and Pregnancy". eMedicine Obstetrics and Gynecology. Medscape. Retrieved 2009-06-16. ↑ North of England Hypertension Guideline Development Group (1 August 2004). "Frequency of measurements". Essential hypertension (NICE CG18). National Institute for Health and Clinical Excellence. p. 53. Retrieved 2011-12-22. ↑ Nelson, Mark. "Drug treatment of elevated blood pressure". Australian Prescriber (33): 108–112. Retrieved August 11, 2010. ↑ Coca A (2008). "Economic benefits of treating high-risk hypertension with angiotensin II receptor antagonists (blockers)". Clinical Drug Investigation. 28 (4): 211–20. doi:10.2165/00044011-200828040-00002. PMID 18345711.